MilitaryByOwner Advertising wants to make your home buying and home selling experience as painless as possible! We realize this may be your first time listing your home for sale or rent with MilitaryByOwner and it can be a little overwhelming. To ease your stress and help you successfully list your home for sale or rent, I asked our customer service team to put together a list of our most frequently asked questions. This is what they shared. Do I have to be in the military to advertise on MilitaryByOwner? Despite the name, you certainly do not have to be military to advertise your home on MilitaryByOwner. Civilians as well as military are allowed to advertise as long as the property is located near a military installation. We have this policy in place to ensure that military families have a broad range of homes to choose from as they make their move to their next duty station. How do I indicate that my home is listed with an agent? You may actually have an agent handling your property listings, and we understand that. When you first begin listing your home on MilitaryByOwner, you will see the field titled “I am.” Simply select “Real Estate Agent” from the drop-down list in order to indicate to home buyers that they will be in contact with your real estate agent rather than you, the owner. Does MilitaryByOwner Advertising handle property management? This question is becoming increasingly more common. While we do not personally manage properties, we do work with homeowners and real estate professionals to advertise homes near military establishments. If more hands-on work is requested by homeowners, we are always happy to refer you to a real estate professional who would be more than equipped to handle your needs. Search for "property manager" in our handy military community business directory! How do I renew my advertisement? If you need to renew your MilitaryByOwner ad, log in to your account, select "My Account" in the right hand corner, and then click "View My Property Ads" located on the left hand side of the page. Click on the "Edit Your Ad" link of the ad you would like to renew. From here, you will be able to make any updates or changes that your ad may need. To complete, scroll to the bottom of the screen and click "Save" and "Continue." The renew option will be at the end of the form. How do I find my old advertisement? We understand that your military tenants may be coming and going at regular intervals and that you may need to list your home multiple times over coming years. Instead of creating an entirely new advertisement for your home, you can easily renew your previous MilitaryByOwner ad. To access your archived ad, log into your account, select "My Account" up in the right hand corner, "View My Archived Ads" on the left hand side, and then the "Restore" tab on the ad. 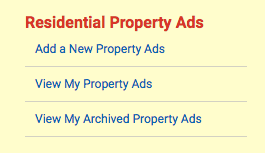 After you have restored it, click on "View My Property Ads," and then the "Edit Your Ad" link on the ad. This will open up the ad form. From here, you can make any adjustments or changes to your advertisement, such as a “new appliances, new flooring, etc.” to include any home modifications you may have made. When you are finished, click "Save" and "Continue." The renew option will be at the end of the form. How do I upgrade my ad? There are several MilitaryByOwner advertisement packages that you can choose from to list your home. Each of them allows you to share information about your home, and with each increase in package comes greater benefits. If you decide you want more features after you have already established a home package, you can still upgrade! To upgrade, log into your account, select "My Account" up in the right hand corner, "View My Property Ads" on the left hand side, and the "Edit Your Ad link" on the Active Ad. The upgrade options are listed in the Basic Information section of the ad form. Once you've received confirmation the upgrade is complete, you may then go back and add more information and photos. While these questions are compiled to help you get your home listed, we understand that you may have more questions once you get started. Please do not hesitate to reach out to our customer service team. It is what they are there for! You are always welcome to call 9 a.m. to 9 p.m., Monday-Friday, EST 866-604-9126 or feel free to reach out on our online chat. Either way, we are here to help you!